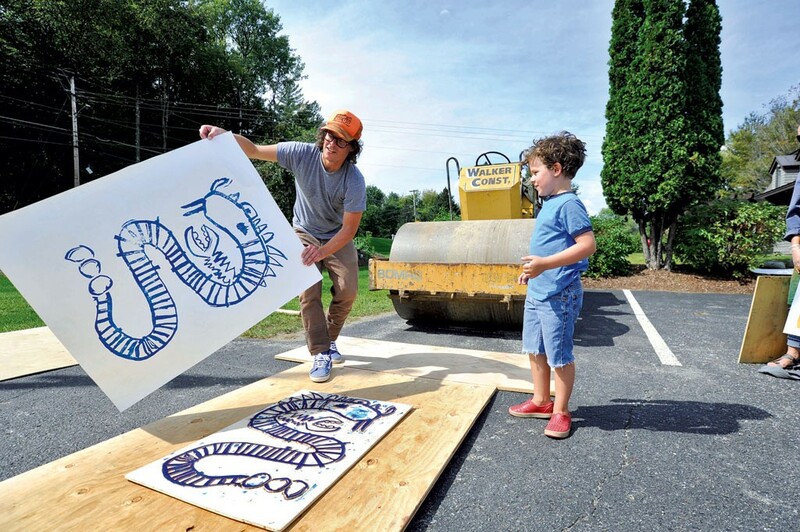 Steamroller Printmaking | The Art Of | Kids VT - small people, big ideas! What kind of supplies do you need to create the most fun art workshop ever? Paint, wood blocks and a construction vehicle — or so it seemed in the Sushi Yoshi parking lot in Stowe one Saturday afternoon in September. Robby Schulze, 6, was utterly spellbound as he watched a heavy-duty steamroller slowly press paper and ink into his woodcarving. As he peeled the paper from the woodcut, Robby beamed at the impression left behind: a multi colored print of the giant house he and his mom, Sue, sketched and carved during the Helen Day Art Center's Steamroller Printmaking Workshop. "I wanted to do a picture of a house because we just moved into a new one," said Robby. He wasn't the only one captivated by the unusual printmaking process. Steamroller operator Nathan Suter — Helen Day's executive director and curator — has been running this workshop for four years. He said he's seen this reaction before. "Their faces light up when they pull up the paper," he said. "They love it." Suter rented the steamroller for the day from Walker Construction in Stowe. He and another Helen Day staffer drove the vehicle over participants' woodcuts to make the prints. Why go to all this trouble? The nonprofit art center launched the workshop to expose a wider audience to art and give more experienced printmakers a chance to work on large-scale pieces. About two dozen people took part in the first workshop, and attendance has grown steadily since. Suter said he enjoys seeing entire families participating in the process — the kids painting while their parents help out. Helen Day education coordinator Susan Holliday agreed. "It's for everyone," she said. "That's what makes this so special — it's not segregated between ages and abilities." Indeed, several artists brought large reliefs they had carved prior to the event. Jeanne Thurston of Wolcott used the workshop to experiment with a design inspired by beehives. Another artist created an intricate woodcut motif meant to resemble a person as seen from above. But the majority of the artistic action came from families, who moved between three stations set up for each step of the printmaking process. Inside the carving tent, Vicki Maier watched her son Dax, 8, etch a circular design that he compared to helicopter rotors, while his friend, 8-year-old McKenzie, carved her name and a heart. Vicki said she and Dax happened upon the event while walking the nearby Stowe Recreation Path last September and decided to try it this year. "I like that this is a more physical way to experience art," she said, "and how he's able to get inspired by other kids here. Plus, he loves big machines." When they finished carving, the trio carried their woodcuts to the painting station, where they used brayers to coat their designs with paint in preparation for the pressing. Dax went right for the green and purple paint cups, rolling the colors onto the wood with vigor. McKenzie was more circumspect in her color choices, eventually deciding on a light blue and green. When their reliefs were painted, Dax and McKenzie carried them to the pressing station, covered them with sheets of paper and placed them in front of the steamroller. The big machine chugged to a start with a burst of black smoke and slowly drove forward a few feet, rolling over their work, then back again. "Whoa," Dax said as he lifted the paper to reveal the finished product. He and McKenzie held up their artwork to a crowd of onlookers. "They look fantastic!" said Vicki. Behind them, several kids sat with the steamroller driver in the vehicle's cab. "Best day of my life!" one of them yelled. The nonprofit hosts a free, one-day lantern-making workshop on Saturday, November 14, 10 a.m.—3 p.m., in preparation for Waterbury's River of Light Community Lantern Procession on December 5. The workshop is open to families with children ages 6 and up. For more information, visit helenday.com.